Travis Dennis is packing his bag and heading to Orlando. He is one of 25 young professionals selected by the United States Geospatial Intelligence Foundation (USGIF) to attend the GEOINT Foreward and Symposium, May 15-18. Participants will also attend a mentoring luncheon, special exhibit hall briefings, and an invitation to the USGIF Chairman’s Reception. With such a great opportunity ahead of him, we sat down with Travis to learn more about his work at Esri and his interests in the GEOINT community. What is your role at Esri? My role is as Inside Sales support to the Defense team, part of National Government Sales. What are some of the new things in the Esri platform that you are excited about for the GEOINT community? There is so much to be excited about with the Esri platform. At the Federal GIS conference we previewed a new data visualization tool called Insights for ArcGIS. We also featured Drone2Map which streamlines the creation of professional imagery products from drone-captured still imagery for visualization and analysis in ArcGIS. There’s also a large suite of other apps that are being released that I’m pretty excited about. What changes do you see for GIS? The new era of software technology is evolving from “Systems of Record” (traditional databases) to “Systems of Engagement”—a software system that serves an entire organization. It’s about making the technology fit into the user’s mission more seamlessly. Why do you think you were chosen by the USGIF for a Golden Ticket? I believe the reason I was chosen for Golden Ticket was because of my involvement with the Esri Young Professionals Network, my hosting of a panel at FedGIS on mentorship for YPN, and my recent enrollment in the MS program in Geoinformatics and Geospatial Intelligence at George Mason U. I’ve taken two classes so far; one on Satellite Imagery; and another on Spatial Agent-Based models (computer simulations of groups of people making decisions). What do you hope to accomplish at the GEOINT Symposium? 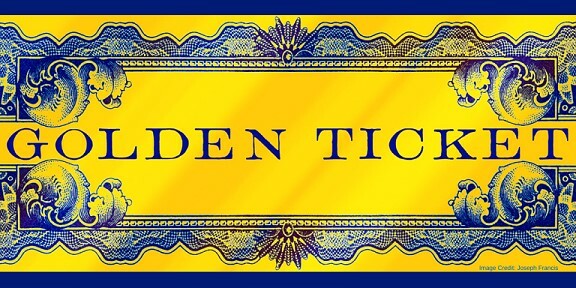 I look forward to meeting the other Golden Ticket winners, making new friends in the field, and being inspired by the leaders who will speak with us. Read more about the all the young professionals the GEOINT Symposium.